Are you someone suffering from GI disturbances such as leaky gut, chronic constipation, frequent diarrhea, acid reflux, or bloating and gas regularly? Then I am so happy you have found this article. When your gut is healthier, you feel better in general. You have a better mood, have more energy, and don’t suffer from weight issues. Signs of an unhealthy gut include gas, bloating, diarrhea, constipation, fatigue, moodiness and overall discomfort after eating. Some people can even suffer from symptoms when they haven’t eaten at all or wake up feeling gastric discomfort which persists throughout the day. Being stressed greatly impacts cortisol levels, and stress can be a factor for some people. Medications can also negatively affect gut health while disturbing the micro flora. The use of nonsteroidal anti-inflammatory drugs, steroids, antibiotics, antihistamines, caffeine, alcohol, and other prescription and nonprescription drugs renders the intestinal mucosa permeable to toxins and undigested food particles. Poor diet, alcohol and the consumption of animal products are key culprits to chronic inflammation within the gut causing a lowered immune response and overall integrity of the GI system overall. Consuming more Vegetables – vegetables provide our body with the nutrients it needs on a day-to-day basis and help to maintain general health as well as decreasing inflammation within the body. They also provide a good source of fiber to keep the gut healthy and help our body eliminate toxins. Eliminate Food Allergies – when you are regularly consuming foods that you may not know you have a sensitivity to it creates a great deal of inflammation within the gut. This allows toxins to leak out of the digestive tract and into the bloodstream triggering a reaction that can create pain and inflammation in the gut. Discovering your food sensitivities is key to healing your gut issues. Dr. Nirvana’s Healthy Gut Program can help you to resolve this for good. Natural antihistamines such as Quercetin, Nettles, Astragalus, Turmeric, and Vitamin C IVs decrease the histamine response by the immune cells responsible for the allergic reactions and resulting symptoms. Dr. Nirvana’s Healthy Gut Program will help you to get to the bottom of what is causing your leaky gut. It is imperative so we can treat it effectively. In some cases this is a complex process but one that allows us to tailor treatment specifically to your unique needs. Taking the time to do this properly can rid you of many unpleasant and persistent symptoms thus revolutionizing your health and well being. If you are suffering from GI distress and are ready to invest the time and energy in getting on track for optimal health to regain your vitality back, then consider scheduling a consultation today. There are so many different supplements out there that promise the world and deliver nothing. 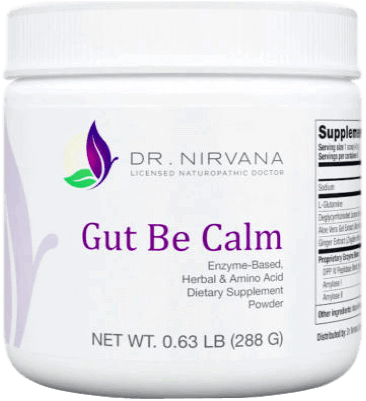 After years of helping patient’s suffering from unnecessary gut issues, I decided to make Gut Be Calm™ available to the public, due to it’s an overwhelming success.